In an attempt to draw awareness to a societal anomaly, an Indonesian restaurant has employed the use of a bizarre form of culinary art. 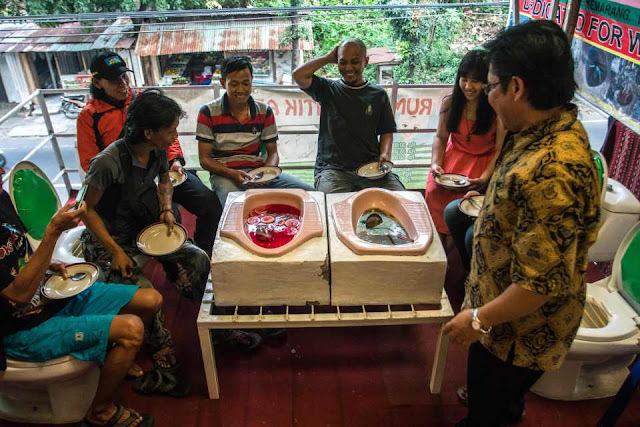 Jamban Cafe, located in Semarang on Java Island, uses old squat toilets as containers for their dishes while customers’ chairs are made from old toilets. The Jamban Cafe was built by Budi Laksono, a public health expert, to depict how 38% of people in the area lack access to toilets. Most of these people have no choice but to defecate outside, which makes them susceptible to typhoid and diarrhoea. “This cafe serves as a reminder that many people in Indonesia still do not have toilets”, says Laksono. 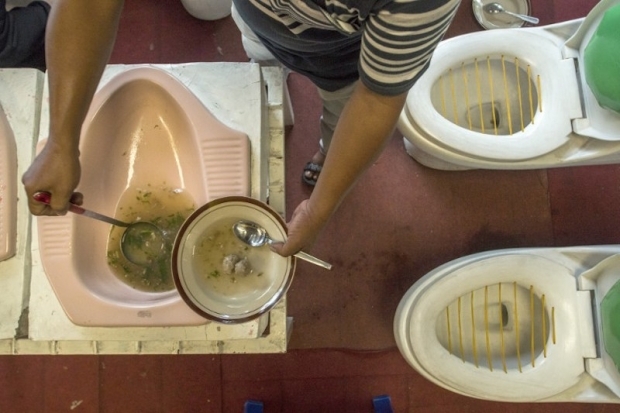 Indonesia, which has one of the world’s highest rates of open defecation, has an estimated population of 255.4 million. Fifty-eight percent of Indonesians live on the island of Java, which is regarded as the world’s most populous island.